The ‘World of DC’ is really going through a shaky patch, at the moment, though the future looks hopeful. But the current scenario inside and outside the DC Entertainment and Warner Bros., is all about negativities, thanks to social media. 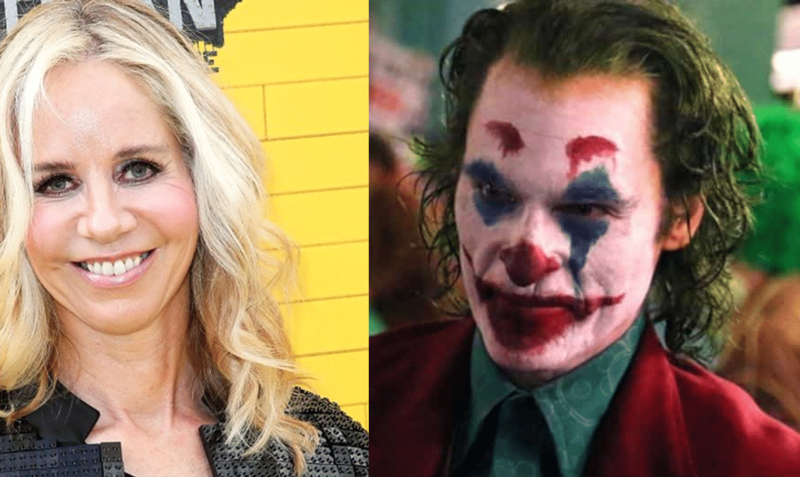 The new case is of former DC Entertainment chief, Diane Nelson, who has deleted her Twitter account following a backlash from the fans on posts supporting the upcoming Joker movie, starring Joaquin Phoenix as the next clown prince of DC. Joker is the only project which has quickly gone into production since Walter Hamada became the new president of DC after Diane Nelson left in June, earlier this year. Nelson was also among those who were impressed by the official reveal of Joaquin Phoenix as Arthur Fleck aka Joker in his make-up photos, a few days ago. So, she wrote that she loved the look and praised the director’s vision (Phillip Todd), the talented actor (Joaquin Phoenix). And she also wrote that Joker movie’s what DC should have been doing after The Dark Knight trilogy of Chris Nolan, years ago. After this, many of the followers, being DC fans, took her post in a different perspective and thought that she was blaming Zack Snyder’s vision for the failure of earlier DCEU films-which isn’t true at all. So, to clarify things, she also responded to the hate comments by writing, that she really admires Zack Snyder the way she likes Christopher Nolan, as both of them have made memorable films. But the hate comments continued even after her trying to make sort out the complications. And then she blocked the comments from non-confirmed followers on her posts, the picture of which you can see, below. 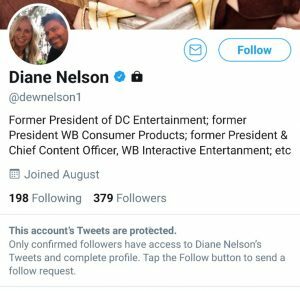 But later, her remarks about favoring Joaquin Phoenix’s Joker also made many DC fans and followers furious, which ultimately forced her to delete her account permanently. Many fans are not happy with Joaquin Phoenix as the new Joker. Well, the cases of big names in the industry deactivating their social media accounts have slightly increased. Before Diane Nelson, Star Wars: The Last Jedi’s Kelly Marie Tran deactivated her Instagram account, after being bullied and Stranger Things’ Millie Bobby Brown had also closed her Twitter account due to similar reasons. Most recently, before Diane Nelson, actress Ruby Rose also left Twitter after being bullied for being cast as the Batwoman for this year’s upcoming Arrowverse crossover. These things are very wrong for the entertainment industry as hatred and negative reactions from users have gone onto a totally different extension, which is dark and dangerous. Tom Clancy’s Jack Ryan Review: It’s a Gripping story! Pingback: WATCH: AVENGERS: ENDGAME Trailer has arrived at last!